Studies have long associated sedentary behaviour with poor health outcomes. In the 1950s a study published in the Lancet showed that bus drivers (who sit) had about double the risk of developing heart disease compared to bus conductors (who stand). 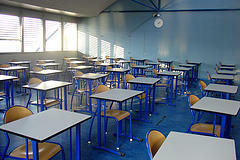 Traditional classroom where students sit for 5 to 6 hours a day. Credit: Thomas Favre-Bulle [CC BY-NC 2.0] via flickr. What’s more, researchers have distinguished sweat-inducing, huffing-and-puffing kind of activity, from everyday, walking-to-the-printer-and-back kind of activity, or what has been called non-exercise activity thermogenesis (NEAT). Working from a desk you would use about 300 NEAT calories a day, compared to working on your feet, where you would use about 1,300 NEAT calories a day. What is even more shocking is that active individuals – those who exercise for at least 5 hours per week – have an increased risk of death if they sit longer. This is because a standing body consumes energy differently from a sedentary body – and also from an exercising one. There is a big difference between exercising too little, and sitting too much. Winston Churchill, Ernest Hemingway and Leonardo da Vinci all knew it. Every trendy office now knows it too: there is a lot to gain from working standing up. From standing desks, treadmill desks and fitness trackers, to groundbreaking pilot experiments in schools, the movement to sit less and stand more is well underway. 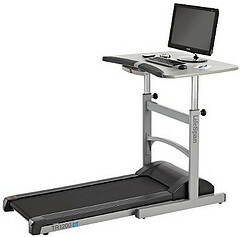 Treadmill desk. Credit: Wicker Paradise [CC BY 2.0] via flickr. “The evidence overwhelmingly suggests that prolonged sitting is shortening our lives and also our quality of life. … In the same way that standing up is an oddity now, sitting down should be.” Dr. James Levine, director of obesity solutions at the Mayo Clinic and Arizona State University, and inventor of the first treadmill desk. Levine and his team strapped sensors to the legs and backs of school students to measure their NEAT levels in a standing, mobile classroom. After 2 months, the NEAT sensors showed that students had double the activity level in the standing classroom compared to the traditional classroom, and they scored up to 20% higher on state standardized tests. “By simply shifting to a standing workday, you can burn 500 to 1,000 extra calories a day”, says Levine. Standing just 3 hours a day, for 1 year, is the equivalent of running 10 marathons. Try a standing desk – you can purchase one, or you can DIY with desks on top of desks, stacks of books or boxes. As long as your monitor is eye level to reduce strain on your neck, and your desk or keyboard height is such that your elbows are at 90 degrees. Try to take a walk every hour – even if it’s just down the hall and back. If you use public transportation to commute, stand instead of sitting. Get rid of wheely desk chairs so that you have to stand up and move around your workspace. “Sitting Time and All-Cause Mortality Risk in 222 497 Australian Adults” is a recent study published in the Archives of Internal Medicine. Next Next post: Teenage SUPER Ninja Turtles- is genetic mutation good for us? Totally agree. Long-time sitting is really bad, and I think every uni student need to do some exercise after a long-day study. I heard sitting is also bad for digestion, because the inside is terribly tried when you always sit. Standing seminars are a great idea haamer! In answer to your question, I think it depends on the type and range of movement that you’re doing, and for how long; for example, fidgeting with your legs would not consume as many calories as pedalling when seated on a bike. I mean would the enzyme and calories RATIO* drop? Lets us start at the uni! We should have standing Seminars!…….. If we are sitting down and we keep moving our legs (somehow), would the enzyme and calories drop? Great post! Nice use of bullet point as well, it keeps the story going. Thanks for the link vchhen – very interesting! Thanks jmaguire – from what I have read, there is no recommended amount of time people should sit or stand per day, but generally, the more standing time, the more calories consumed. It has also been acknowledged that standing desks don’t work for everyone, and simply standing up for a short walk every half hour/hour is just as good! What an interesting post! Sitting down is often seen as unavoidable as a uni student since I mainly need a computer for my work. I have never considered a standing desk as a viable alternative to sitting down but maybe I should give it a go. Is there a recommended amount of time people should sit down and stand up per day? I would be interested to hear what the experts say. Thanks!